Rep. Stratton Bone addresses the crowd. Several Democratic supporters flocked to the Courthouse Square for a rally in honor of Stratton Bone and George McDonald Tuesday evening. 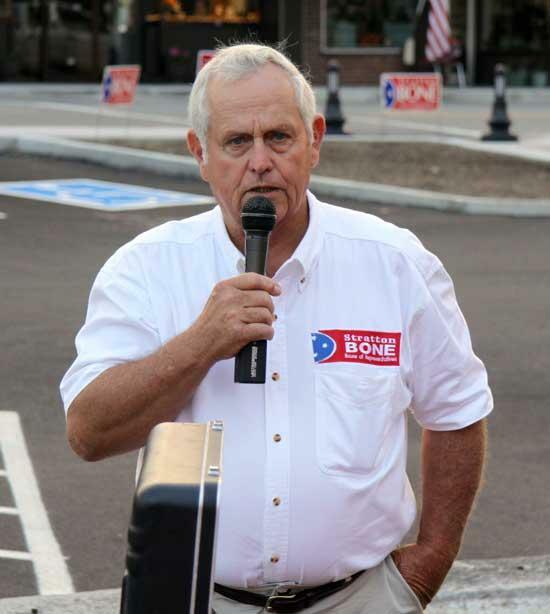 Bone (D-Lebanon) is running for re-election for the District 46 House of Representatives, while McDonald is running for the Tennessee State Senate, District 17. Supporters gathered for an old fashioned watermelon cutting and hotdog supper while meeting and greeting the candidates. Both candidates also took time to officially address the crowd, talking about their stance on the issues as well as the good things that are taking place in Cannon County. The 2010 General Election is Nov. 2. See PHOTO GALLERY from rally.